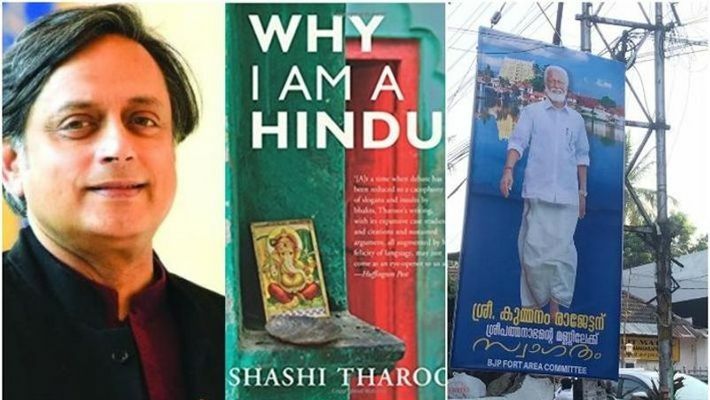 Kummanam Rajasekharan said Shashi Tharoor's book cover, "Why I am a Hindu" portrayed fundamentalism and pointed out that the book covers also contained a picture of Lord Ganesha. Thiruvananthapuram: When a Thiruvananthapuram UDF candidate accused Kummanam Rajasekharan for allegedly advertising Sabarimala during the election campaign, Rajasekharan countered the allegations by asking why the UDF was advertising fundamentalism. Controversy is rife regarding the campaigns of the UDF and the BJP in Thiruvananthapuram. The UDF has alleged that the BJP was campaigning in the name of Sabarimala. Rajasekharan in turn said that Shashi Tharoor's poster with his book cover, "Why I am a Hindu" portrayed fundamentalism. According to sources, Tharoor's book cover also contained a picture of Lord Ganesha. Tharoor had lodged a complaint before the Election Commission stating that the BJP carried a poster which includes the picture of Lord Padmanabhaswamy. In this incident, Rajasekharan said, the BJP didn't have any role in bringing out a poster of Sree Padmanabhaswamy. Social activist Rupesh Chirakkal said, " Congress workers themselves made a poster which contains the image of Sree Padmanabhaswamy to defame the BJP candidate Kummanam Rajasekharan." On March 11, Kerala’s Chief Electoral Officer Teeka Ram Meena said proper guidelines would be given to the parties in the state for the upcoming Lok Sabha election. Sabarimala women entry cannot be used for the election campaign and it would be a violation of the code of conduct, Meena explained. He added that strict measures would be imposed for using Sabarimala as a topic for the campaign during the upcoming Lok Sabha election in Kerala. He also said that he would discuss the matter with representatives of all the political parties. On March 15, the Election Commission issued directives to the LDF to refrain from violating the model code of conduct and remove all unauthorised political advertisements in public places.